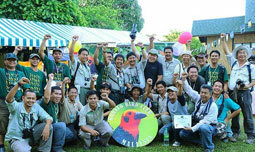 Birds Club International is a non­commercial organisation that aims at promoting global interest in birds, conservation of nature and the environments through public campaigns and education. Started in 2010, by National and International award­winning Indian filmmaker, Jayaraj Rajasekharan Nair, as part of Jayaraj Foundation, it is registered as a charitable organisation to revive and conserve environment, by tapping and utilising optimum natural resources­ with the focus on BIRDS to convey our message. Birds are beautiful, inspirational, appeals to all geographies and also serve as excellent flagships and vital environmental indicators of the climate and weather conditions of any place. By focusing on birds, and the sites and habitats on which they depend, the Birds Club International aims at improving the quality of life of birds, other species of insects and animals (biodiversity), and people at large. Birds play a number of roles in any ecosystem. They play a balancing role in the ecosystem and are part of cultural enhancement and part of tasks such as predation, pollination and seed dispersal. Birds Club Intl. aims at evolving rain groves in the rather dull concrete jungles of our world. These groves will build sustainable ecosystems which would also help in soil and water conservation. These would become homes to a number of birds' species, insects, animals and plants that help preserve nature. The vision of Birds Club International is to provide a forum for all across countries, to share their interest in birds and preserving the nature at its best, aiming at gradual and sustainable developments in the process. We strive to address, in all ways we can, a number of issues that affect us, our wildlife and habitats; by undertaking activities and projects, we seek to persuade people to revive, protect and preserve our environments. As much as we appreciate the beauty of birds and nature, it is as well a need of the hour to protect it­­ as we are a part of this all­embracing nature and our survival also inevitably depends on it; as also on the vital role we play in preventing to the extent we can, the adverse effects such as rising temperatures, climatic changes and so on.